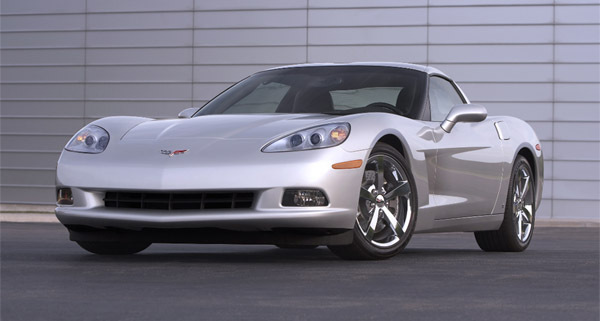 The all-new LS7 of the ’06 Z06 reintroduces the 427-cubic-inch engine to the Corvette lineup. Unlike the previous 427 engine, which was a big-block design, the new 7.0-liter LS7 is a small-block V-8 - the largest-displacement small-block ever produced by GM and a tribute to its 50 years as a performance icon. With 505 horsepower and 475 lb.-ft. of torque, it also is the most powerful passenger car engine ever produced by Chevrolet and GM. The LS7 is easily identified under the hood by red engine covers with black lettering. The LS7’s CNC-ported aluminum cylinder heads are all-new and designed to meet the high airflow demands of the engine’s 7.0-liter displacement, as it ingests approximately 100 cubic feet more air per minute than the Corvette’s 6.0-liter LS2 V-8 - an 18-percent increase in airflow. Consequently, a hydraulic roller camshaft with .591/.591-inch valve lift is used to allow plenty of air to circulate in and out of the engine. To ensure optimal, uninterrupted airflow, the LS7’s heads have straight, tunnel-like intake runners. Very large by production-vehicle standards - even racing standards - they are designed to maintain fast airflow velocity, providing excellent torque at low rpm and exhilarating horsepower at high rpm. The heads feature 70-cc combustion chambers which are fed by huge, 56-mm-diameter titanium intake valves. The lightweight titanium valves weigh 21 grams less than the stainless steel valves used in the LS2, despite the valve head having 22 percent more area. They are complemented by 41-mm sodium-filled exhaust valves, vs. 39.4-mm valves in the LS2. To accommodate the large valve face diameters, the heads’ valve seats are siamesed; and, taken from experience with the engines of C5-R racecars, the LS7’s valve angles are held at 12 degrees - versus 15 degrees for the LS2 - to enhance airflow through the ports. All LS7 engines are assembled by hand at GM Powertrain’s new Performance Build Center in Wixom , Mich. The exacting standards to which they are built include deck-plate honing of the cylinders - a procedure normally associated with the building of racing engines and almost unheard of in a production-vehicle engine. Oil circulates through the engine and down to the oil pan, where it is sent back to the reservoir via a scavenge pump. The large-capacity reservoir, combined with a high efficiency air-to-oil cooler, provides necessary engine oil cooling under the demands of the engine’s power output. With the dry-sump system, oil is added to the engine via the reservoir tank - which includes the oil level dipstick. The LS7’s dry-sump system was developed and tested on racetracks in the United States and Europe , including Germany ’s famed Nürburgring. And while common in racing cars, the Corvette Z06 is one of just a handful of production vehicles - and the only production Corvette - to ever incorporate such a high-performance oiling system.